Two recent hawls, so I might as well just show them both here. 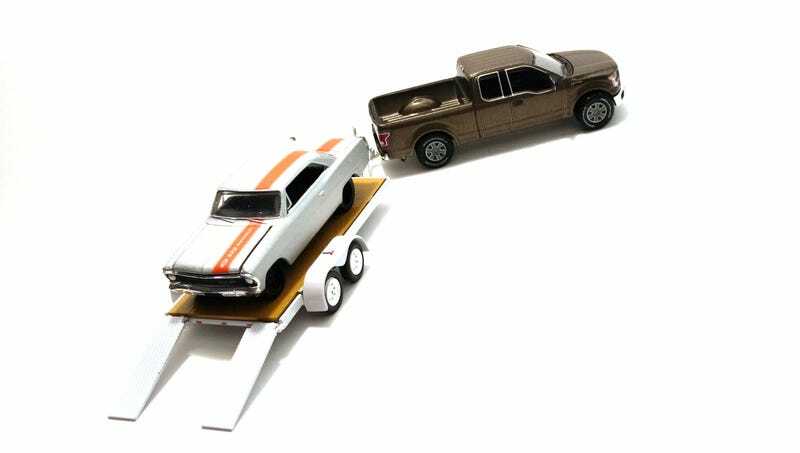 First, the Greenlight Hitch & Tow Ford F-150 with the flatbed trailer. Nothing says ‘Murica! like a truck that will probably never be utilized to the fullest. The newest series of Hitch & Tow just arrived at my local TRU, and I saw this and the blue Silverado on the pegs. I almost walked out with that one too, but I’ll wait and see. This Ford was a must-have. I love the color, and detail is amazing throughout. I’m not too familiar with the trim levels of these trucks, but this one looks rather upscale and luxurious, which is exactly the type that will never see heavy duty use. Maybe it’s the color, and maybe it’s the wheels. Either way, it looks great, and this H&T set is worth it for this alone. This is my first flatbed trailer, and I’m having trouble clipping those pieces in the back. Other than that, no significant quality issues. The second is an M2 Machines Chevy Nova, a Target exclusive from the Auto Drivers series. It’s my first Nova of any kind, and I liked the simple flat silver and modified look. The quality is awful, but that’s what you get when you buy M2.